The cowboys at Jackson Hole’s famous Million Dollar Cowboy Bar shoot pool and drink beer like they rope steer — charging hard without much concern for what’s around them. After all, despite Jackson Hole’s reputation as gateway to the vast, Greater Yellowstone Ecosystem, it remains at heart a cowboy town, rugged and dusty. Not the annual flood of tourists, visits by the president, or 20-something mountain bikers will ever change the soul of Jackson. Unlike most Western “resort” towns, there is in Jackson the underlying reality that tourism will never completely wrest control here. Lycra will not replace leather. But, politely step aside from this reality, and Jackson, surrounded by some of the most beautiful forests and mountains in the West and bisected by the wide Snake River, offers hikers, backpackers and mountain bikers unending vistas of outdoor pleasure. The greater Jackson area (see our 40K map) includes Gros Ventre Wilderness, Jedediah Smith Wilderness, Targhee National Forest, Bridger-Teton National Forest and Grand Teton National Park. While this area is visited by a crush of tourists, many are on their way to Yellowstone. If they do stop, few venture far from the parking lot. Deeper into the forests, it is possible to find solitude, tranquility and wildly dramatic scenery. Out of sight of Winnebagos and visitors centers, this wild land warrants repeated visits, or, better yet, a permanent stay. The land is fed by hundreds of clear, fast-running streams, supporting a profusion of plant and animal life. Wildflowers bloom well into August, as higher elevation plants show their colors later in the season. Brilliantly clear Jenny Lake in Grand Teton National Park sits at the base of the Teton Range, with the signature Tetons dominating the scene. Hiking around Jenny Lake is best done on weekdays during the warmer months, as weekends often bring large crowds. Early in the morning, however, the bright, crisp air and lack of crowds creates a magical setting for a hike, with fantastic views of Grand Teton. While the seven-mile hike around Jenny Lake through lush conifer and colorful understory flowers, with a stop to view Hidden Falls on the west side, is worthwhile, consider taking the Cascade Canyon trail. (Most hikers go no further than Hidden Falls.) 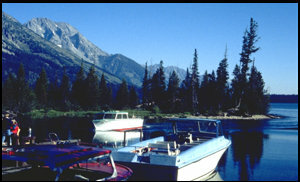 From Jenny Lake’s east shore dock, boats (for $4 roundtrip) offer passage across the lake to the Cascade Canyon trailhead. This shaves about 2.5 miles off the trek, a savings that will be appreciated as one discovers the beauty found along the Cascade Canyon trail. 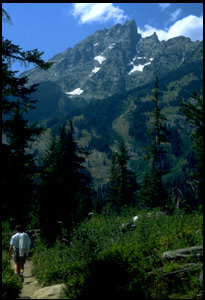 The Cascade Canyon trail follows Cascade Creek gradually uphill to a fork about 4.5 miles from Hidden Falls. To the right another 2.7 miles is Lake Solitude at 9,035 feet. The canyon is between the Teton Range’s St. John Group to the north and Cathedral Group to the south, and these towering, jagged spires reveal themselves gradually along the trail. The return to Jenny Lake is a pleasant downhill hike. Nursing a Coors back in town at the Rancher bar, just off the square in downtown Jackson, we thanked the foresight of Jackson’s founders and patrons (including industrialist John D. Rockefeller Jr.) who managed to preserve the vast public lands of greater Jackson. Yet efforts to create the national parks and forests were successful only with concessions made to local ranchers, who insisted on maintaining their grazing rights. With the summer crowds beginning to dwindle, the cowpokes seemed happy to reclaim their town. Even as many ranches are being converted to “ranchette” subdivisons, we wouldn’t dare wear Lycra in Jackson (or anywhere else, for that matter). The real cowboys of Jackson just wouldn’t put up with it.